I’ve had a busy few days recently but I’m starting to get back on the ball- preparing for going back to university, keeping on top of housework, work and blogging has taken its toll a little bit but who doesn’t love a challenge! I thought I’d do a little September Reading list post as I haven’t done one in a while. I’ve only got 4 books on my list this month because I know how busy I’m going to be, but I’m sure I’ll get them finished pretty quickly. 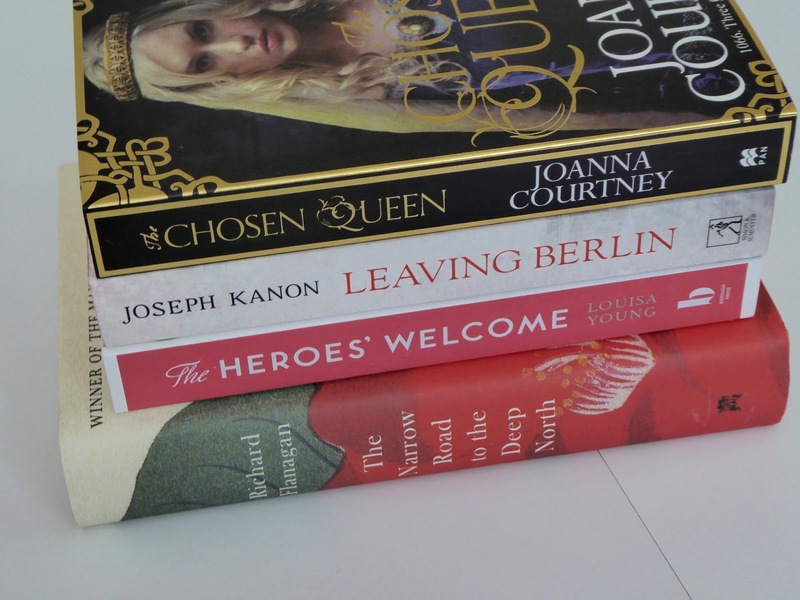 I received a copy of The Chosen Queen by Joanna Courtney from the lovely team at Pan Macmillan. I’ve actually heard quite a lot about this book and was thrilled when I was asked if I wanted a copy of it sending to me. Joanna Courtney is being advertised as being the next Philippa Gregory and that’s an absolutely enormous accolade. I haven’t started it yet but it’s first on my list for this month. Sticking with my theme of reading war fiction, the other three books on my list are war related in some way or another. My second book is Leaving Berlin by Joseph Kanon, set in post-war Berlin. This book jumped out at me in Waterstones and then when I got to the counter it was set up there as one of the reads of the month so I definitely think it was a good choice. My second of three war based fiction choices is The Heroes’ Welcome by Louisa Young. This novel is set after the end of World War One and focuses on its affects. My final choice is one that I’ve had for a while and haven’t got around to reading- The Narrow Road to the Deep North by Richard Flanagan, which is set in Japan. I’m excited to get stuck into these books and post my reviews up here!